Instagram impacts #GivingTuesday for the first time ever! Now that #GivingTuesday 2016 has come and gone, we’re busy checking out the data and numbers to see just how big of an impact this 24-hour period had on philanthropy and fundraising. The biggest surprise for us: For the first time in our #GivingTuesday history, Instagram made an appearance as a donation referral tool! 2.6% of social donations came from Instagram (compare with 2.8% from Twitter and a whopping 93% from Facebook). 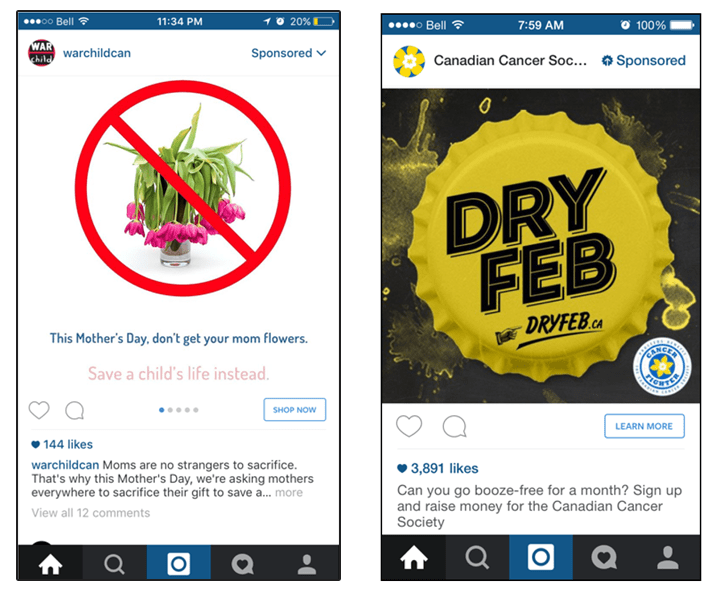 Charities are increasingly experimenting with sponsored posts on Instagram. The rise of Instagram-fuelled donations coincided with a drop in Twitter’s influence (this year it was down -8% over 2015’s results, which lines up with Twitter’s slow decline in usage overall), with Instagram users donating an average of $43 to the charity of their choice. How did Instagram get in on the #GivingTuesday action this year when they never had before? We can think of a few reasons! In the past year, Instagram amped up their ad platform, enabling companies to purchase sponsored posts that allow users to click out to another website. As more and more nonprofit organizations are using Instagram as a communications and stewardship channel, they're also testing the use of strategic paid posts. It’s easier now for charities to implement call-to-actions through Instagram posts (rather than just sharing a link in the bio!) and our #GivingTuesday 2016 numbers clearly reflect this shift. There’s also the fact that we need to account for the power of millennials and Generation Z. The latter demographic in particular is extremely focused on philanthropy – according to a Maclean’s article, 60 per cent of Generation Z look for jobs with “a social impact,” and 26 per cent already volunteer – and it’s no surprise that they flock to Instagram more than Facebook (which is seen as old news). Charities that reached out through Instagram made the wise choice to engage with this socially conscious generation. What you can take away for 2017? For next year’s #GivingTuesday (and your year-round fundraising efforts in general! ), take a closer look at how your social media activities are performing for you. If you’re looking to target a new, potentially younger demographic, find out what social media platforms they use the most – Instagram is clearly among them. You may want to consider paying a small amount to test how Instagram ads and sponsored posts can work for your organization. Remember, you can set your own budget and test posts for as little as $20 a day! The same idea applies to any other social media accounts your charity may be running. Are they as effective as they could be? Is your content useful and engaging? And remember, if you saw a drop in your #GivingTuesday donation amounts across Twitter, it was a common trend this year and might just dictate how much effort and money you should put towards next year’s Twitter efforts. #GivingTuesday 2016 showed how the impact from various social media platforms can fluctuate from year to year – and sometimes new platforms get in the mix as well! It’s always worthwhile to experiment, test, and examine what sort of results you get from what social media you’re using, and if you could expand to channels that better target the audience you want. (Remember our Facebook vs. Twitter infographic from last year?) It could just help you have an even better #GivingTuesday in 2017. Love this stuff and want more? Subscribe to our blog using the form below to make sure you get the latest nonprofit trends and topics!